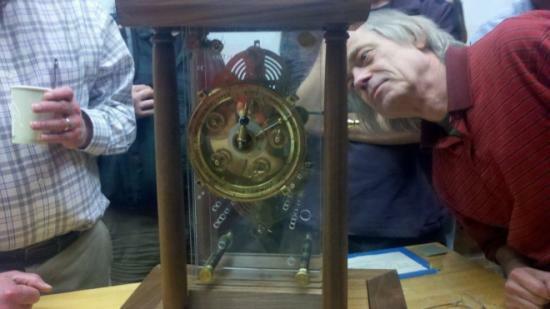 Astronomers at the University of Washington inspect Evans’s model Antikythera mechanism. Credit: Lisa Grossman/Wired.com. The world’s oldest astronomical calculator is famous for having intricate gear systems centuries ahead of their time. But new work shows the Antikythera mechanism used pure geometry, as well as flashy gears to track celestial bodies’ motion through the heavens. The surviving pieces of the original mechanism. Credit: Antikythera Mechanism Research Project. The device, a 2,000-year-old assemblage of gears and wheels that matched 19th century clocks in precision and complexity, was salvaged from a shipwreck off the Greek island of Antikythera in 1901. Earlier research showed the device also accounted for a subtle weirdness in the motion of the moon. Because the moon’s orbit around the Earth is an ellipse, not a perfect circle, the moon seems to speed up and slow down over the course of a month. In 2006, Tony Freeth of Cardiff University and colleagues showed that a clever configuration of two overlapping gears, with the top gear laid off-center from the bottom gear, could give the moon’s marker its irregular speed. Because of the Earth’s elliptical orbit around the sun, the sun makes a similarly variable trip across the sky, speeding up and slowing down over the course of the year. But the effect is much more subtle than for the moon. 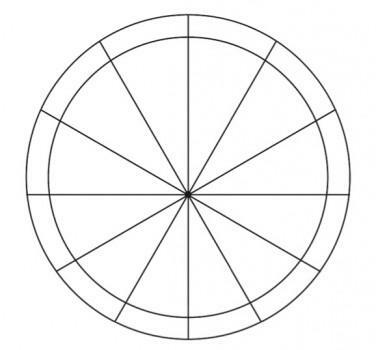 A nonuniformly divided circle, like the one that may have represented the zodiac. Evans et al 2010. “It’d be very hard with gears to mimic an effect so small,” Evans said. Also, if there were any extra gears related to the sun’s movement in the original mechanism, none emerged from the shipwreck. Evans and colleagues suggested a simpler way to make the sun dial appear to change speed: Stretch the zodiac. If the spaces on the front wheel of the mechanism were of different widths, Evans reasoned, then the hand representing the sun would take longer to travel through the part of the year lumped under the zodiac sign of Taurus than through Libra. 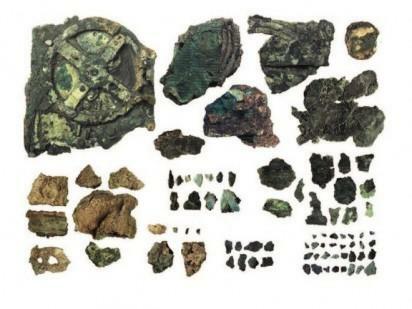 To check this idea, the researchers examined X-ray images of the Antikythera mechanism, parts of which were badly corroded. In a paper last year in the Journal for the History of Astronomy (which Evans co-edits), the team analyzed 69 degrees of the circle that was preserved well enough for the zodiac names and markings to be read. Since then, the team has extended the study to 88 degrees of the circle. They found that the two circles representing the zodiac and the Egyptian calendar were divided differently, and in just the right way to account for the sun’s irregular speed. “It made more sense to do it this way than to try to use an elaborate wheel upon wheel sort of thing, as they did for the lunar orbit,” Evans said. At his talk in Seattle, Evans showed off a brass and wood reconstruction of the Antikythera mechanism (shown at top) that includes the stretched zodiac, as well as wheels depicting Mercury, Venus, Mars, Jupiter and Saturn. The planetary gears are still controversial, he said, and not all Antikythera experts agree with his zodiac model, either. But Evans is confident. “Our reconstruction of the way the solar anomaly worked, I think you can bet your retirement savings on it — or, 5 percent of them,” he said. The mechanism would probably not have been a practical way to keep track of the passage of time, he added. Every time he moves his model for demonstrations, the gears shift around and it takes him an hour to get it working again. Rather, he said, the machine was intended to be a source of wonder.